On January 16th in 1986, I attempted suicide. Drunk, disgusted, and fed-up, I locked myself in the garage and started my vehicle. I don't know how long I was in there, but I do remember vivid pictures of my parents. Still fighting and yelling. Dad blaming Mom, for me being such a failure. My ex-wife, broke in the door to the garage, turned the car off, left, and called the police. A few hours later, I was in protective custody. For the next 72 hours, I was tested and observed. Did I see images or hear voices? Same questions, over and over again. Go to therapy and talk about life and why I wanted to die. After those 72 hours the doctors and therapists at that psych ward, came away with the answer, which I knew for years, but didn't want to admit. That being, that I was an alcoholic. I wasn't crazy, just a drunk. On Martin Luther King day, 19 years ago, I quit drinking. That suicide attempt kept me clean for five and a half years, but that suicide attempt did not keep me sober. I could admit to being a drunk, but at that time I still couldn't accept it. That acceptance would come in 1994, when the pain I inflicted on myself, began to be inflicted on others. Those five and a half years, would be the foundation, for a new sobriety, which has now lasted ten years. That foundation was built on a day honoring a man, I heard of, but never really knew. It would be Martin Luther King, his ideals and his beliefs, which would give me the power and the encouragement to move forward and try again. Though my sobriety, started on a day honoring him, didn't last, I still look back and recognize it as the day, in which my world began to turn. "I had a dream," was his message and became my goal. His ideals to end racism, cease with violence, and end poverty world wide, became my goals in a smaller world. As a society, we have made progress against racism, but we still have far to go. In our local newspapers, I have written editorials about homosexuality and the way we treat Native Americans. I was "beat-up" for months after they appeared, basically saying that I didn't know what I was talking about, I was just a bleeding heart liberal. My point was that though we may not understand a lifestyle or the way certain people "perform" in our society, we have no right to say that their way is wrong. That we have the power to pray for them, that hopefully, they will be accepted, or at least maybe we could understand. At the turn of the last century, when Native Americans were forced to move from their homelands, some wouldn't go. They believed they should have a voice in their own decisions. Chief Standing Bear of the Ponca tribe of Nebraska, argued before a Nebraska judge in 1879, that Indians were people. It's been 125 years since Standing Bear spoke to the court in Omaha. With his arm outstretched, he said: "That hand is not the color of yours, but if I pierce it, I shall feel pain. If you pierce your hand, you also feel pain. The blood that will flow from mine will be the same color as yours. I am a man. God made both of us." He too, had a dream. We can pick up any newspaper, watch any newscast, and realize we have a long way to go with violence. As an individual, the idea of physically hurting someone, left me when I quit drinking. But through sobriety, my eyes were opened to a new form of violence. Before, my present marriage, I dated a little bit. Three different ladies, from three different backgrounds, told me the same thing. That they would rather be physically abused, instead of emotionally abused. They said the scars from a physical beating, would heal, while an emotional beating could last a lifetime. I began to see, how much pain I had inflicted on others, with the use of my own word. To this day, I battle verbal abuse. It is so easy to inflict and sadly, I don't recognize it until it is to late. Eventually, my dream is to only speak and seek, loving, kind, comforting words. The key to it all, is poverty. They are the segment of our society which holds the power. Do we allow it to grow, or do we stop to try and help? I don't have much to "give" as far as finances or possessions, but I give my time. And by writing, hopefully, I'm spreading the word, that we as a society, need to stop and help our fellow man. We can't treat them like a forgotten segment of our society. We can't push them to a certain area of land, hoping they will disappear. It is my belief, that we can not stop violence, or racism, until we stop poverty. At the 1988 Democratic National Convention, Jesse Jackson gave a powerful speech about dreams. He talked about his childhood and the many poor people he had met throughout his life. The one thing no one could take away from them were their dreams. As his voiced raised, he kept saying, "Remember your dreams, never forget your dreams. We most live in reality, but never forget your dreams." As he kept speaking the audience got louder, finally Jackson started chanting "Keep hope alive! Keep hope alive!" As the crowd joined in, he went back to, "Never forget your dreams, always remember your dreams." "Keep Hope Alive." 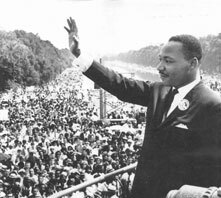 It was Martin Luther King, who began to show us a new world, one of equality, one of peace, with no poverty. Using the thoughts of Chief Standing Bear, King helped us remember that we were all made by the same God. So don't forget your dreams. Remember them, live them. Make your dreams - a reality. A reality of peace, where everyone is equal, and poverty is abolished not only on our land, but all lands. Your words are powerful my brother, continue to teach, we have all fell short, but through the grace of God, we shall over come, you are a master poet, as well as writer, it is not the lesser evil, but the rewards that came from God. Continue to write my brother, your words of wisdom, as you, as martin, your dream the blessing of God, fear not man, fear God, he comes through you, it brings joy to my heart, to know that you are my brother, and we are on the same side of God, again this is excellent, I will come back again. Thank you so much for sharing this Dave....this explained MLK well!! Thank God I have no Alcohol problem but my husband really do...and the verbal abuse thingy is so very true...but he started to inflick both physically and emotionally...and that in my eyes are of the "Baddest" kind....and I do admit...suicide did enter my mind many times...but knowing I will have to share "Hell" with him also it made me change my mind every time!! Thank you Dave and I too was an alcoholic but I battled my demons and I have Native American blood.